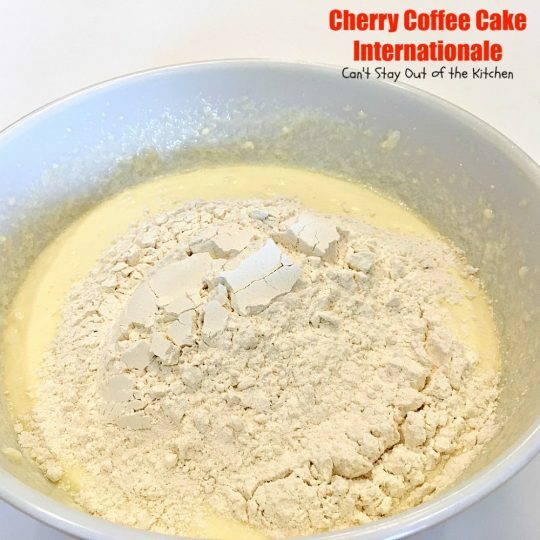 Cherry Coffee Cake Internationale is one of the best coffee cakes you’ll ever eat! It has long been a family favorite breakfast recipe. 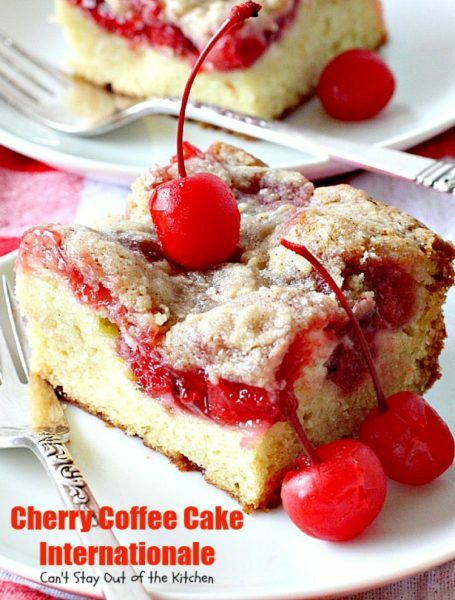 Cherries are one of those fruits we love and they are certainly great in this great tasting coffee cake. 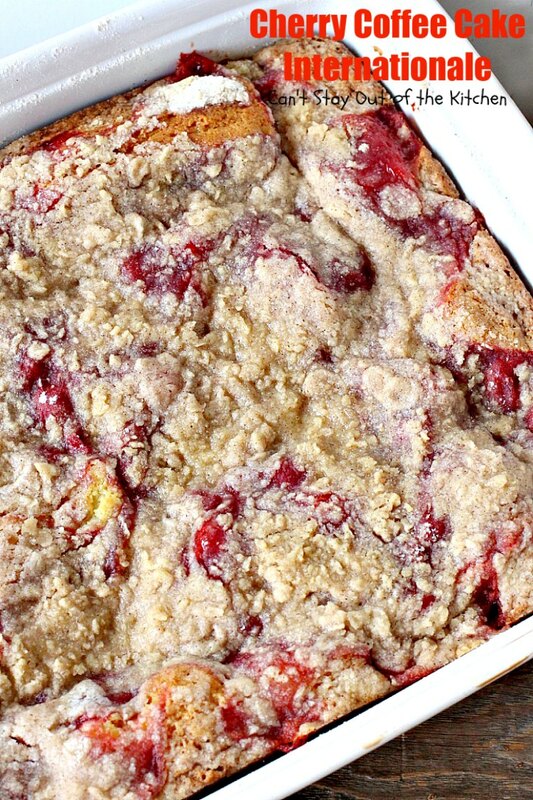 The streusel topping adds another layer of deliciousness. 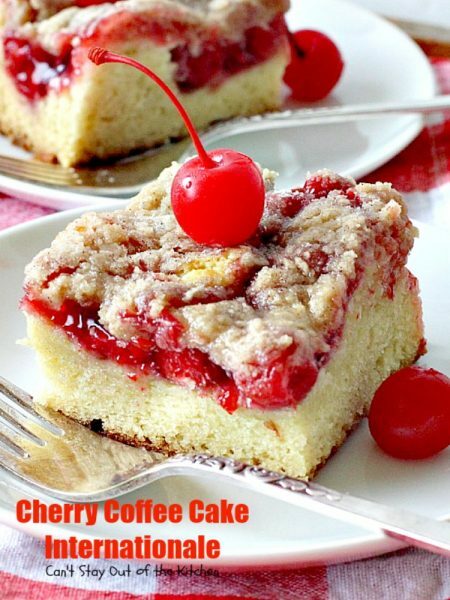 This delightful coffee cake is wonderful for holiday or company breakfasts. I made it frequently for our family when our kids were growing up. Back in the early 1920s my grandfather purchased a piece of property in southeastern Ohio. He had worked in the coal mines in West Virginia about 5 years in order to save up enough money to buy this nest egg. He worked another ten years in order to build on the property, furnish his large two-story home and barn, and move his family there some time later. Remember those were the days when everything had to be paid for in hard, cold cash. No loans or mortgages. He had immigrated in the early 1900s from Prague, Czechoslovakia, as a young teenage boy with his brother. He married my grandmother (an arranged marriage) when he was 22 and she was 14. She started having kids 4 years later and they ended up with nine. My mom was number 4. Soon after mom was born he had finally saved up enough money to build on the property, so they moved west to the rolling hills in Ohio that would become their home and a place of great childhood memories for me. One of the first things grandpa did was plant three large cherry trees in their front yard. Those trees would have been 40+ years old in the 60s when we used to visit grandma and grandpa “on the farm” every year for summer vacation. Cherry pie was regularly on the menu, but we would eat fresh cherries too. So I grew up loving cherries. I love them in fruit salad, cake, pie, coffee cake, muffins, cheesecake, cobbler, cookies and desserts! You get the idea. 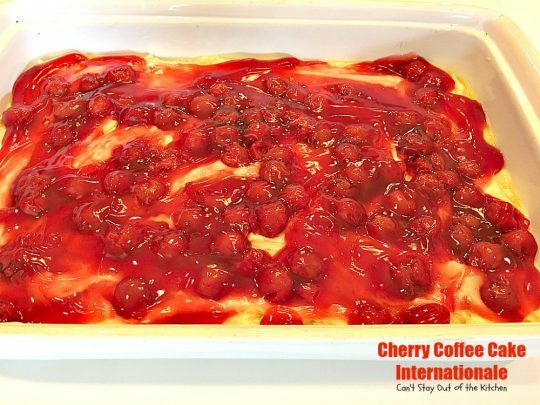 I found this recipe in a magazine back in the early 1980s, but I don’t know where. All I know is we’ve made it a lot and everyone has always enjoyed it whenever I’ve brought it for potluck. If you’re looking for a fabulous coffee cake to wow your friends or family on Father’s Day, I highly recommend this one. Prepare to have a smile on your face after just one bite. Yum. 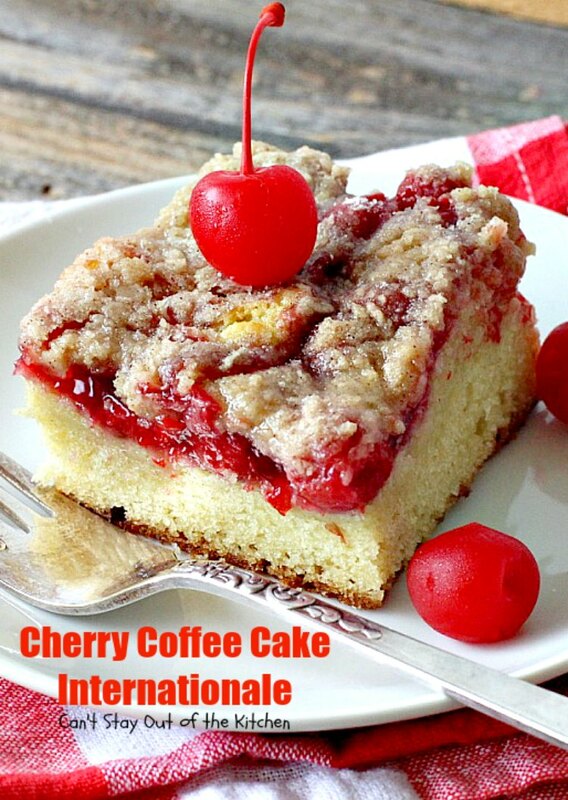 Cherry Coffee Cake Internationale has always been one of our favorite coffee cakes for breakfast. This amazing coffee cake is nice and moist because of the cherry pie filling in the center. Cherry Coffee Cake International is perfect for holiday breakfasts. Soften butter. Add sugar, sour cream, eggs, almond extract and baking soda. Stir with a wooden spoon to combine. 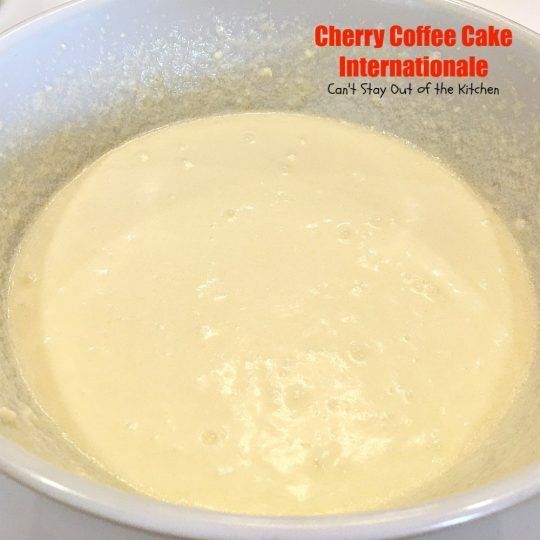 Don’t overmix the batter and don’t try mixing this with a mixer or it really toughens the batter. Spread batter into a greased 9×13″ glass baking dish. Spread the can of cherry pie filling over top of the cake batter. 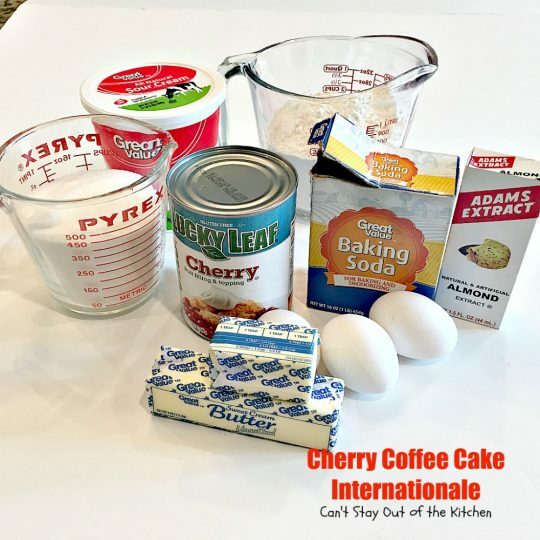 I used these ingredients for the streusel topping. 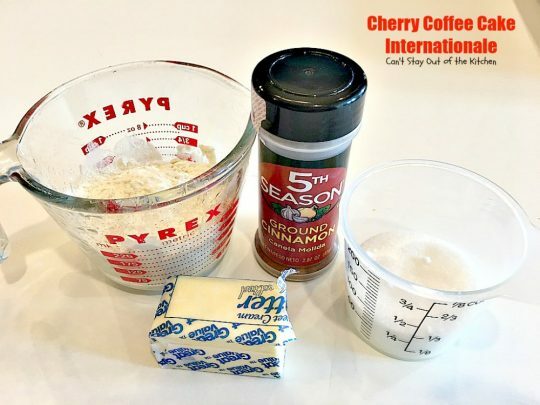 Combine flour, sugar and cinnamon in a mixing bowl. 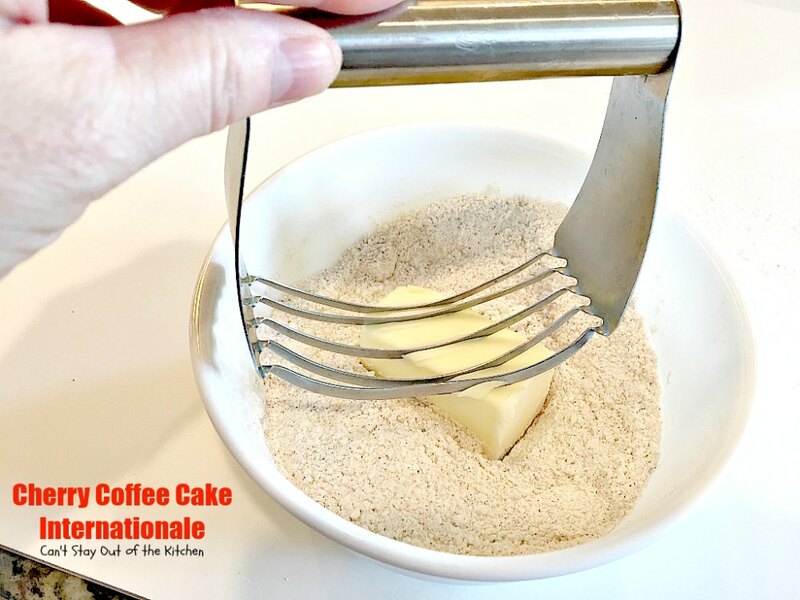 Cut in butter with a pastry blender until coarse crumbs form. Sprinkle streusel topping over top of cherry pie filling. 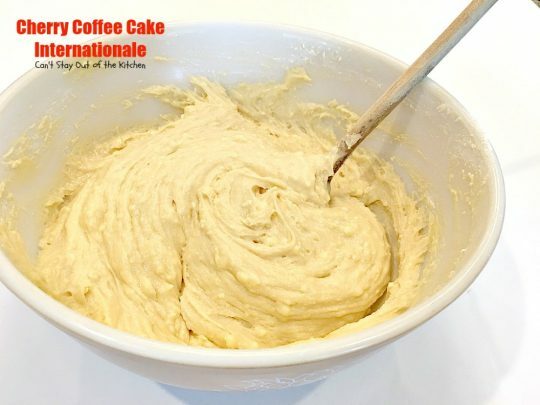 Bake at 350 for 45-60 minutes or until a toothpick inserted in center comes out clean and cake is set. 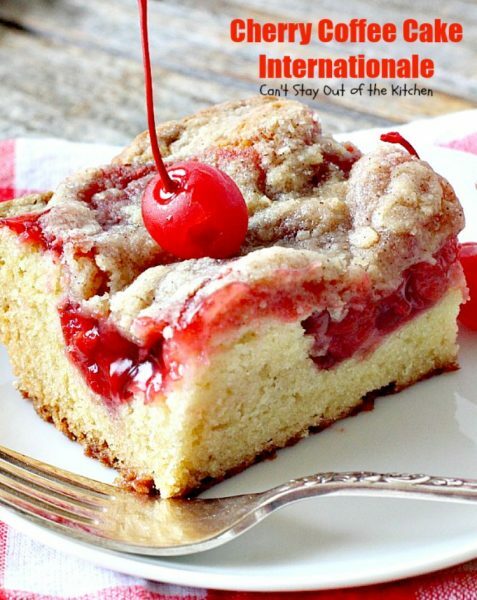 Every bite of Cherry Coffee Cake Internationale will have you drooling. No kidding. If you enjoy cherries you’ll love this coffee cake. My husband has always preferred coffee cakes with fruit in the batter because he dislikes dry cakes. This one has always been one of his favorites for that reason. 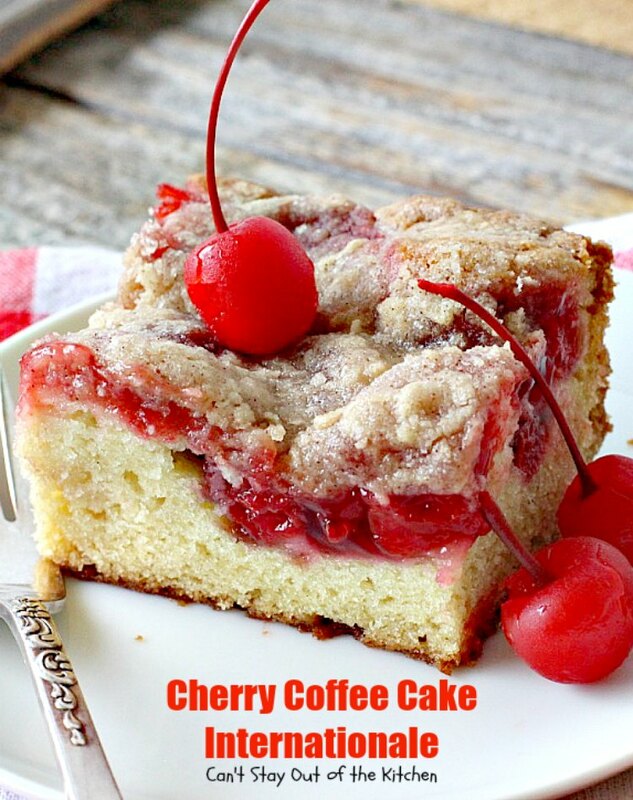 This coffee cake is not too difficult to make. 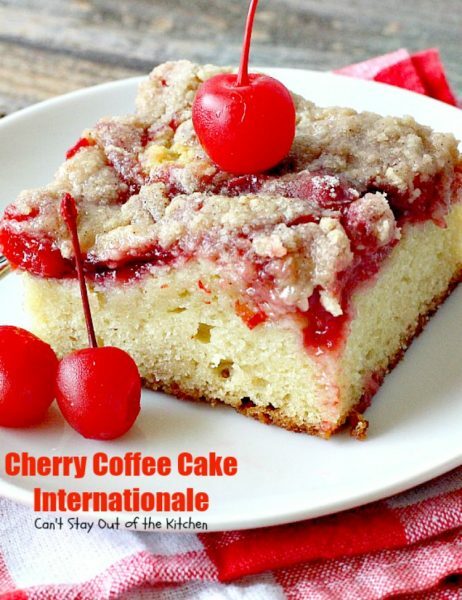 If you’re an early riser, you can have this made before everyone gets out of bed on Memorial Day or other summer holidays. 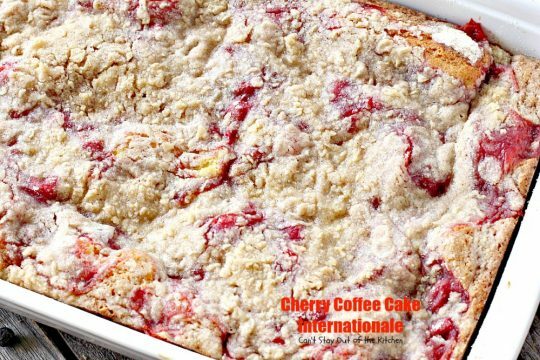 This luscious coffee cake has a delicious cherry pie filling layer topped with a streusel topping. 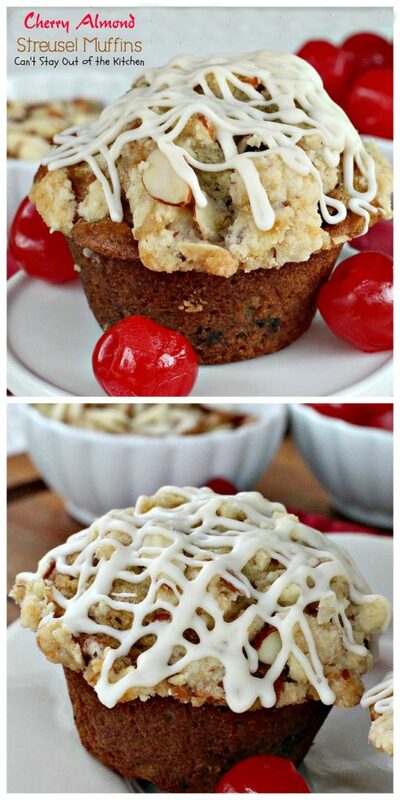 It's a great treat for holiday breakfasts. 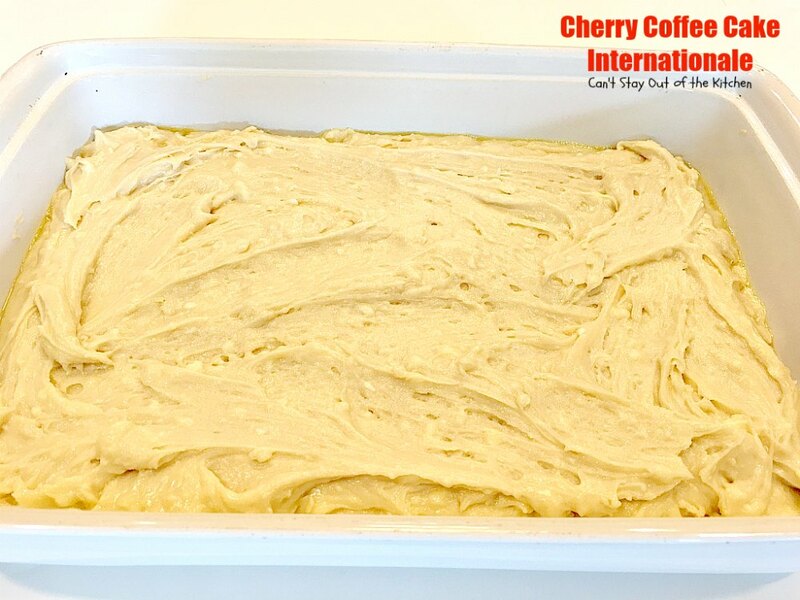 Grease a 9x13” baking dish. 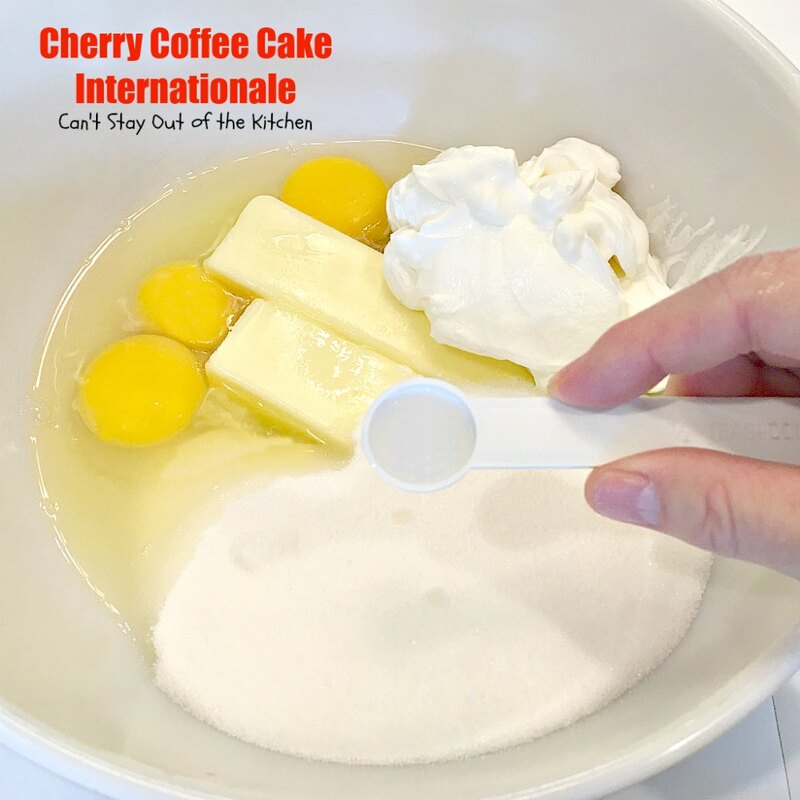 Cream butter, sugar, eggs, sour cream, baking soda and almond extract until smooth and creamy. Add flour and stir with a wooden spoon to combine. Do not over-mix; just stir in. Spread pie filling over top of batter. 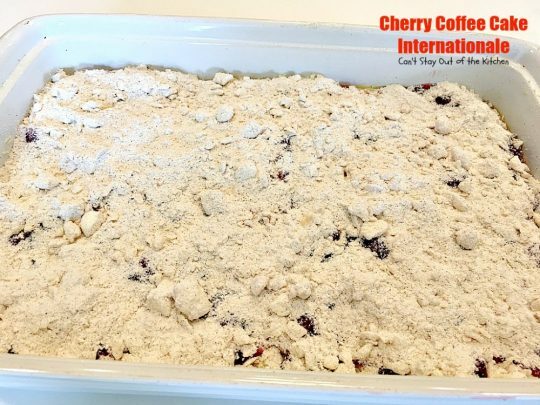 Sprinkle streusel topping over cherry pie filling. Bake 45-60 minutes or until cake is set and tests done. NOTE: Avoid the temptation to overmix the flour with the other ingredients. Just stir until ingredients are moistened. We love Cherry Coffee Cake Internationale and believe you will too.